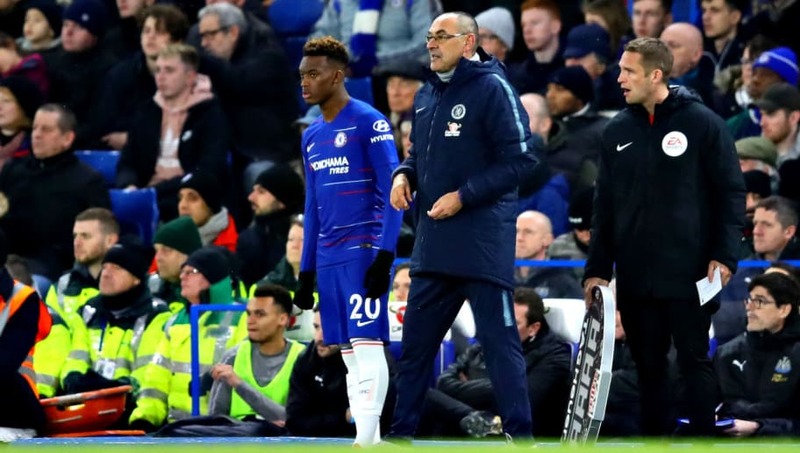 ​Maurizio Sarri is facing a wave of backlash from Chelsea's hierarchy for failing to provide Callum Hudson-Odoi with sufficient game time. Hudson-Odoi appeared destined to leave Chelsea for Bayern Munich during the January transfer window, but the Blues rejected the youngster's transfer request in a bid to convince him to remain at Stamford Bridge, at least until his contract expires in 2020. The 18-year-old took to the field more frequently in January but, as soon as the transfer window closed at the end of the month, he has found first team opportunities much harder to come by. According to ​the Mirror, that has not gone down well with ​Chelsea's chiefs. After being left out of the squad to face Bournemouth at the start of the month, Hudson-Odoi went on to make a cameo appearance off the bench against Huddersfield before being left out entirely during the Blues' embarrassing 6-0 defeat at the hands of Manchester City on Sunday - a result which further increased the pressure upon Sarri's shoulders. After Chelsea made their stance clear during the January transfer window, the club were set to reassess Hudson-Odoi's situation at the end of the season. However, the Mirror go on to suggest that, even if Sarri refuses to budge with regards to Hudson-Odoi, a move elsewhere is far from a certainty. ​Eden Hazard's future remains up in the air, and if the Belgian opts to leave the club in the summer, then Chelsea would be unwilling to lose Hudson-Odoi at the same time. Real Madrid are still strongly linked with a move for Hazard and the 28-year-old has already claimed to have made a decision about where he future lies.